While previous research suggested an association between Food Stamp Program participation and obesity for women, more recent data suggest this association may be weakening for some women, USDA's Economic Research Service (ERS) reported this month. Unfortunately, the reason for the narrowing gap is that the risk of obesity has been worsening for low-income nonparticipant women, while it has been holding steady at a high level for women who participate in the Food Stamp Program. Among women, food stamp participants are not getting relatively heavier over time. 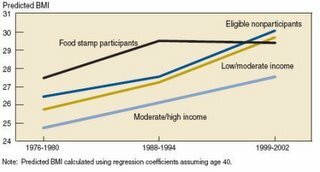 Rather, BMI has grown more among eligible nonparticipants -- and even among women with higher incomes -- than for food stamp recipients. This is especially true for non-Hispanic White women. In 1976-80 and 1988-94, White women who participated in food stamps had greater BMI and were more likely to be overweight and obese than eligible nonparticipants and those with higher incomes. 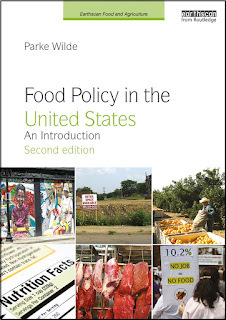 By 1999-2002, these differences had largely disappeared; the only exception was that White women in the moderate/high income group were still less likely to be obese than food stamp recipients. The closing of the BMI gap is due to changes in weight status by nonparticipatingng women -- the average BMI of food stamp recipients remained steady. For non-Hispanic Black women and Mexican-American women, the trends are not as striking, but the general picture is the same. Among Non-Hispanic White women, body mass index (BMI) has held steady for Food Stamp Program participants while continuing to increase for nonparticipants.